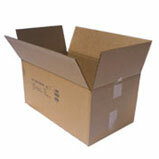 We carry a large range of secondhand cartons. These may be previously used cartons or redundant unused cartons from production overruns or product changes, which make the outer carton unusable. Some cartons are one-off purchases but most are sizes that we collect regularly from our suppliers. They may be made from single or double walled board. Some are plain (unprinted) while others will have a small amount of printing on them. Available quantities shown are indicative only as we will have sold some cartons and collected others. Pricing will be provided on request.